You have been completely misled, misinformed, and in some cases, intentionally lied to about cholesterol. An unfortunate mishmash of scientifically questionable studies, corporate greed, and deceptive marketing has conspired to create one of the most damaging misconceptions in medical history: that cholesterol causes heart disease. The real tragedy is that by focusing on cholesterol, the true causes of heart disease are altogether ignored! It is NOT a coincidence the obesity and diabetes epidemics spiraled out of control during the same time low-fat, high-carb diets were being hailed as the healthy alternative to those containing more cholesterol and protein. 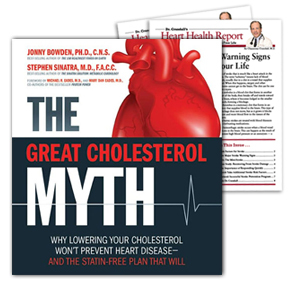 The Great Cholesterol Myth exposes Big Pharma for deliberately misleading people about the dangers of high cholesterol levels to scare them into taking statin drugs. In fact, when the National Cholesterol Education Program lowered the "optimal" cholesterol levels in 2004, eight out of nine people on the panel had financial ties to the pharmaceutical industry. And here's the shocker: Cholesterol is actually good for you! Cholesterol promotes healthy brain and digestive function and is essential in helping the body produce hormones and vitamin D.
In The Great Cholesterol Myth, you will discover why cholesterol's been taking the fall for your heart's REAL natural enemies — and find out what you can do right now to prevent and even reverse heart disease. It's time to get the TRUTH about cholesterol and say good-bye to heart disease forever. IMPORTANT NOTE: Sales tax included where applicable. Your trial subscription comes with convenient automatic renewal. At the end of your subscription, we'll notify you. If you want to keep the publication, do nothing and we'll renew your subscription using your credit/debit card on file. We'll charge you $54.95 (or $49.95 for digital) for one year (12 issues) of Dr. Crandall's Heart Health Report and thereafter at the lowest rate then in effect. There is no risk, you can cancel within the first six months for a full refund of the unused portion of your subscription.